Great Sitkin Volcano is a composite andesitic stratovolcano on Great Sitkin Island (51°05’ N latitude, 176°25’ W longitude), a small (14 x 16 km), circular volcanic island in the western Aleutian Islands of Alaska. Great Sitkin Island is located about 35 kilometers northeast of the community of Adak on Adak Island and 130 kilometers west of the community of Atka on Atka Island. Great Sitkin Volcano is an active volcano and has erupted at least eight times in the past 250 years (Miller and others, 1998). The most recent eruption in 1974 caused minor ash fall on the flanks of the volcano and resulted in the emplacement of a lava dome in the summit crater. The summit of the composite cone of Great Sitkin Volcano is 1,740 meters above sea level. The active crater is somewhat lower than the summit, and the highest point along its rim is about 1,460 meters above sea level. The crater is about 1,000 meters in diameter and is almost entirely filled by a lava dome emplaced in 1974. An area of active fumaroles, hot springs, and bubbling hot mud is present on the south flank of the volcano at the head of Big Fox Creek (see the map), and smaller ephemeral fumaroles and steam vents are present in the crater and around the crater rim. The flanking slopes of the volcano are gradual to steep and consist of variously weathered and vegetated blocky lava flows that formed during Pleistocene and Holocene eruptions. The modern edifice occupies a caldera structure that truncates an older sequence of lava flows and minor pyroclastic rocks on the east side of the volcano. The eastern sector of the volcano includes the remains of an ancestral volcano that was partially destroyed by a northwest-directed flank collapse. In winter, Great Sitkin Volcano is typically completely snow covered. Should explosive pyroclastic eruptions occur at this time, the snow would be a source of water for volcanic mudflows or lahars. In summer, much of the snowpack melts, leaving only a patchy distribution of snow on the volcano. Glacier ice is no longer present on the volcano or on other parts of Great Sitkin Island as previously reported by Simons and Mathewson (1955). Great Sitkin Island is presently uninhabited and is part of the Alaska Maritime National Wildlife Refuge, managed by the U.S. Fish and Wildlife Service. 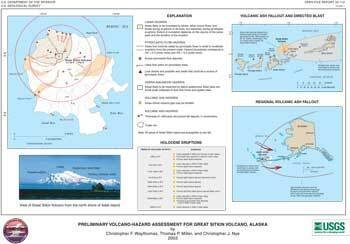 Waythomas, Christopher F., Miller, Thomas P., Nye, Christopher J., 2003, Preliminary Volcano-Hazard Assessment for Great Sitkin Volcano, Alaska: U.S. Geological Survey Open-File Report 03-112, 32 pp., http://pubs.usgs.gov/of/2003/0112/.